When you think of Lunch Lady Hero, think Darin Brito! Darin is the Manager at Juniper Kitchen, serving over 700 students at Juniper Elementary School in Escondido, CA. This is the first year UC San Diego Center for Community has worked with Juniper Elementary and it has been an awesome school year. All Juniper classrooms participated in the Harvest of the Month in the Classroom Program this 2015-16 school year for the first time. Not only were students engaged in curriculum-based nutrition education in the classroom, but Darin and her team made sure that learning continued in the cafeteria. When beets were the Harvest of the Month for November, Darin roasted and served the beets with spices so the students could try it both cooked and raw on the salad bar. She also displayed a bowl of whole beets in the lunch line so students could see and touch the vegetable in its natural form. When kindergarten teacher Greeta Lemon gave feedback that she would like her class to try cooked greens in a recipe, Darin did a cooking demo of Krazy Kale Salad for Ms. Lemon’s classroom. 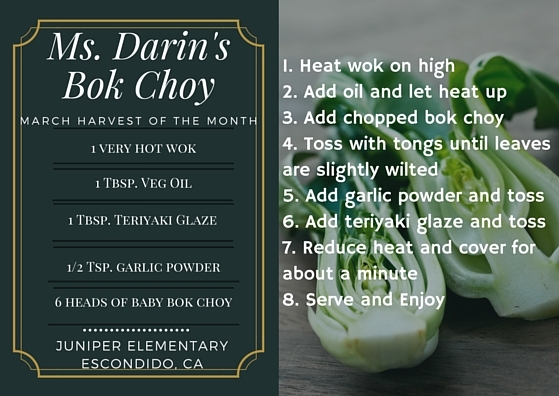 That same month she brought her wok from home to prepare a bok choy stir fry for the salad bar. April’s Harvest of the Month was cucumber. Darin provided cucumber-mint spa water for students to drink during lunch and handed out Persian cucumber slices with a made from scratch dill yogurt topping. These efforts demonstrate the lengths she and her team are willing to go to expose students to the delicious bounty of locally-grown Harvest of the Month produce. 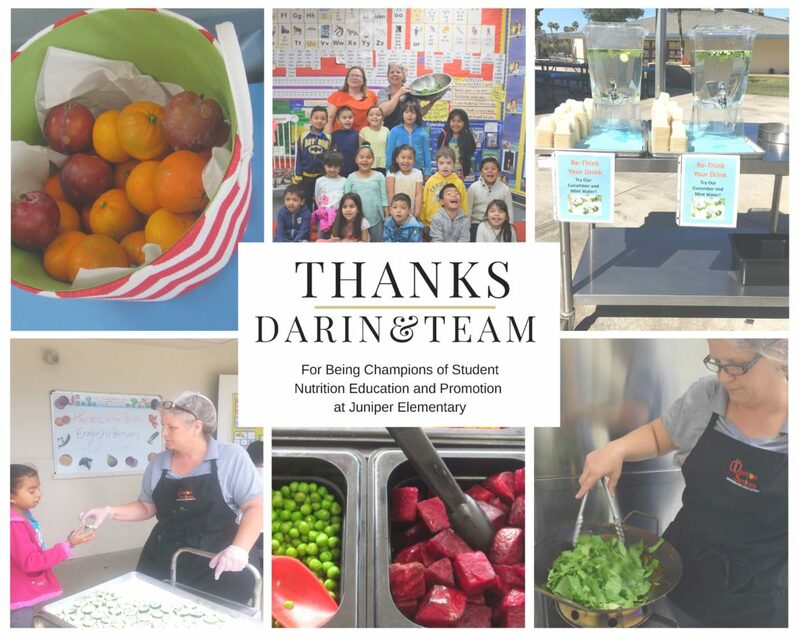 Harvest of the Month’s overall success at Juniper was due in large part to a foundation of support from Principal Jason Wrezski, the willingness of Juniper teachers to take on a new program, and the team at Escondido Union School District’s Nutrition Services. Juniper Elementary is a true testament of how nutrition education can successfully go beyond the walls of the classroom when nutrition services champions like Darin Brito put their creativity, talent, and passion for food and student health into action. We are grateful to work with such phenomenal partners.